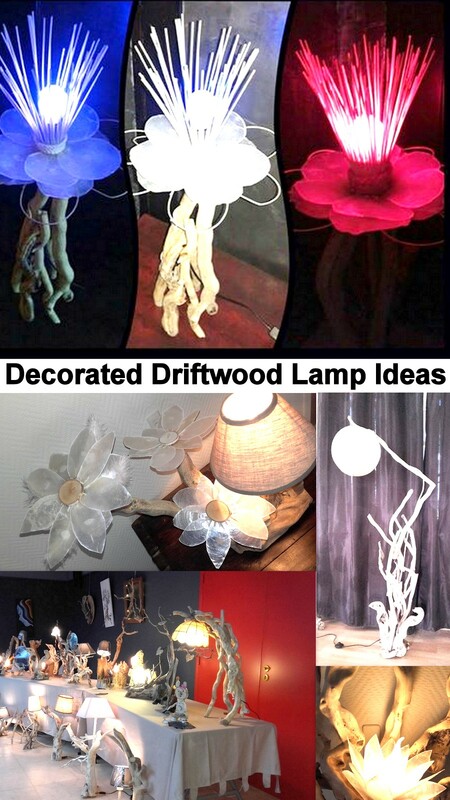 In some of the earlier projects of recycling we have used the driftwood in making different table lamps and that idea was very widely appreciated and acclaimed by the folks. 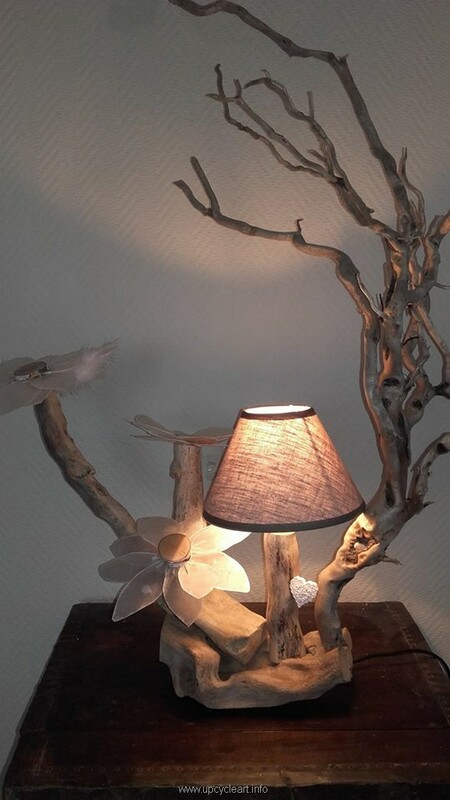 Many people have tried those driftwood recycled lamp ideas and many of them sent us pictures of their projects too. This was very encouraging for us that people are really listening to the ideas that were apparently crazy yet worthy enough to be given a try atlest for once. 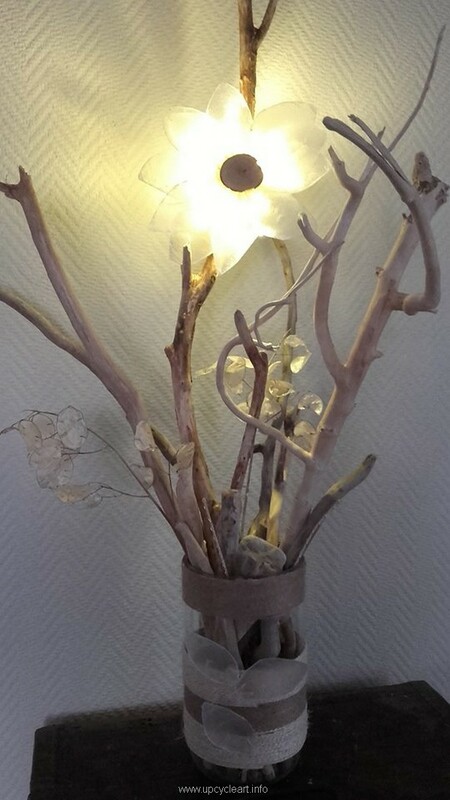 Today we are going to make the same driftwood repurposed lamps but this time we would be focusing on their decoration too. 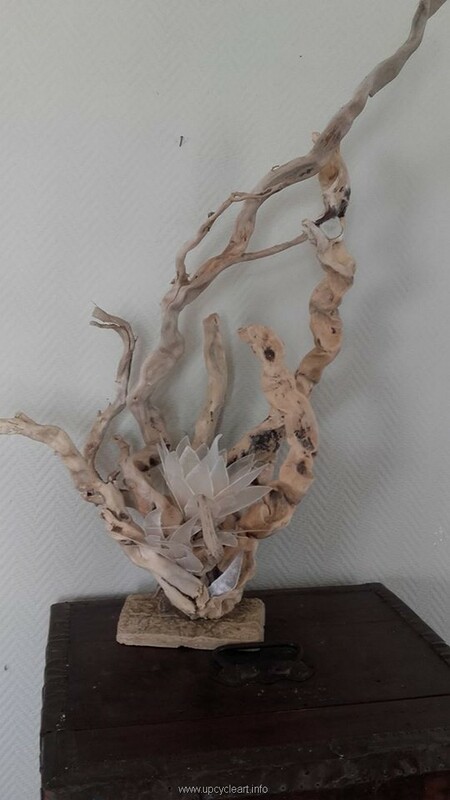 In the very first driftwood recycling project, we have seen a skeleton like object that we were certainly expecting as you cannot expect any proper shape of the driftwood. 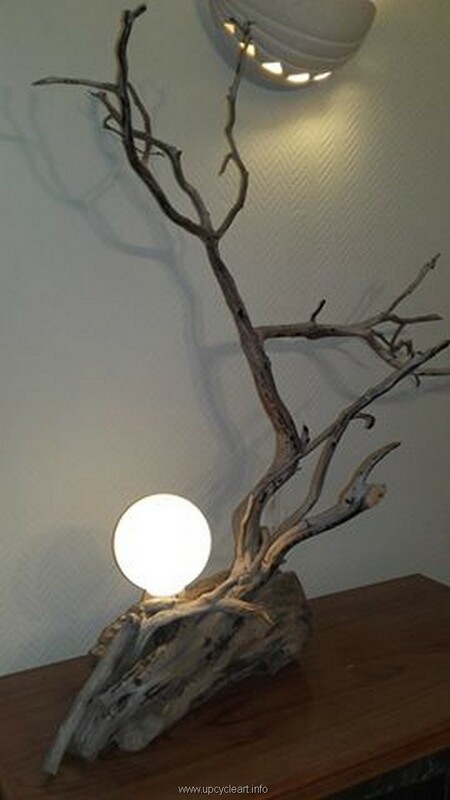 We simply used a simple lighting globe here that is usually installed on the main entrances. 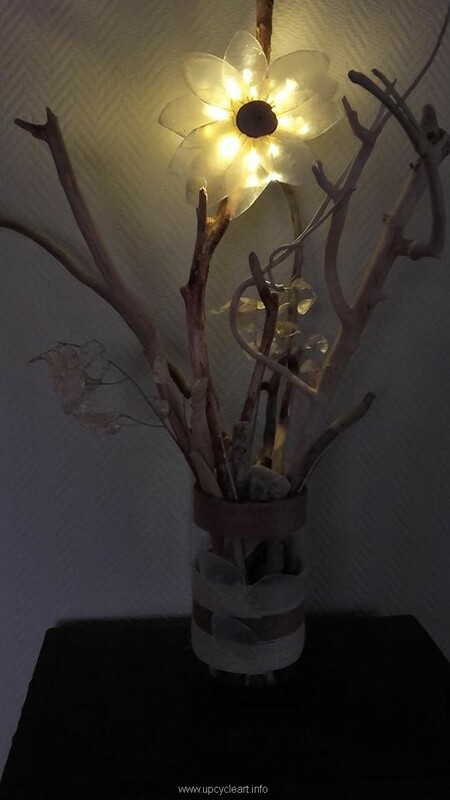 Even here we have made the base of the lamp by using some cardboard pieces and scotch tape. 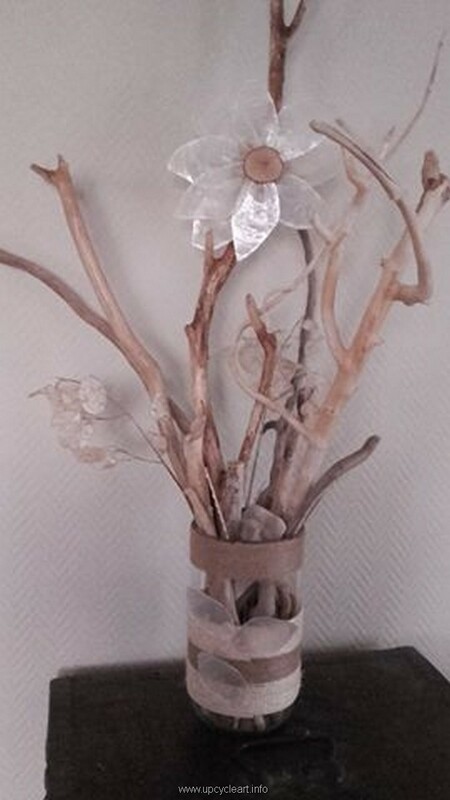 While on the upper portion we have used the netting made floral objects that were also artificially made. 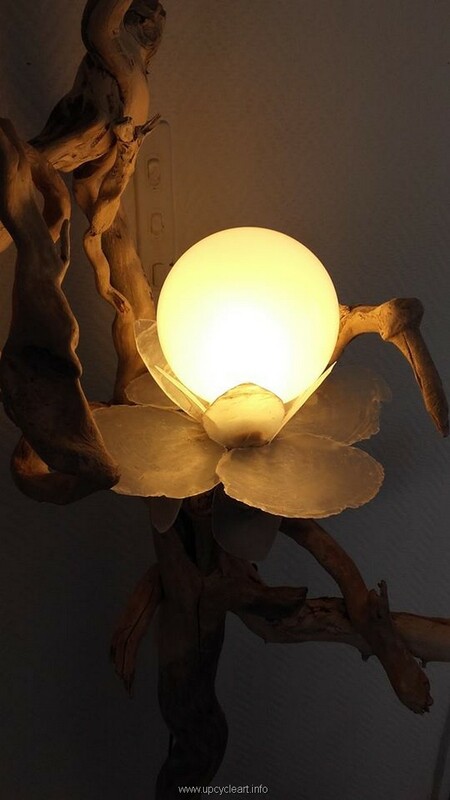 Right inside them we have attached a common small Edison bulb and in the end it really looks great. Same netting made floral embellishment is used here again. 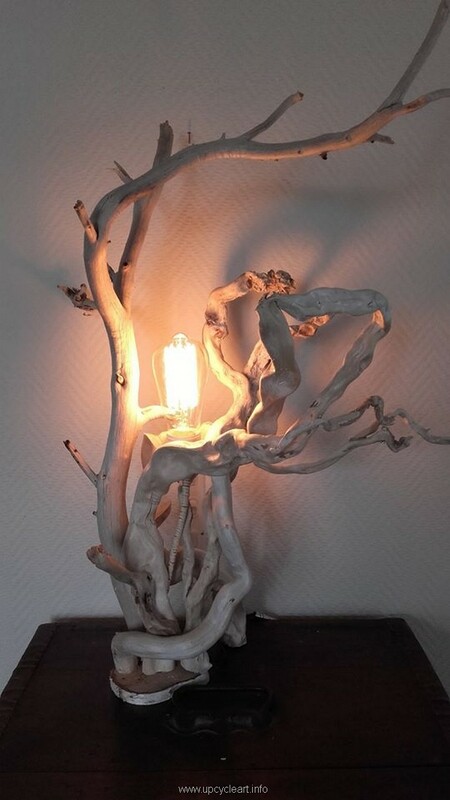 Here rather we witness some proper lighting work in the wooden frame and the driftwood recycled lamp. This is probably some cornered and insolated area of the house which was spared for purely decoration purposes. This one is really awesome. 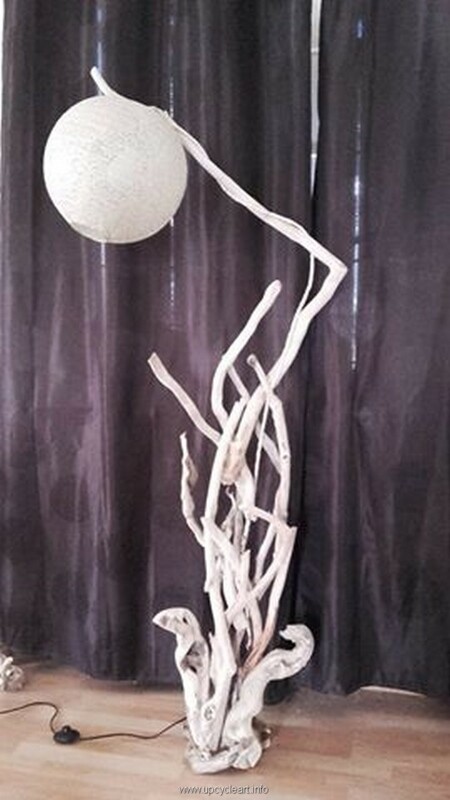 We have used here some couple of additional materials that are other than the simple driftwood. 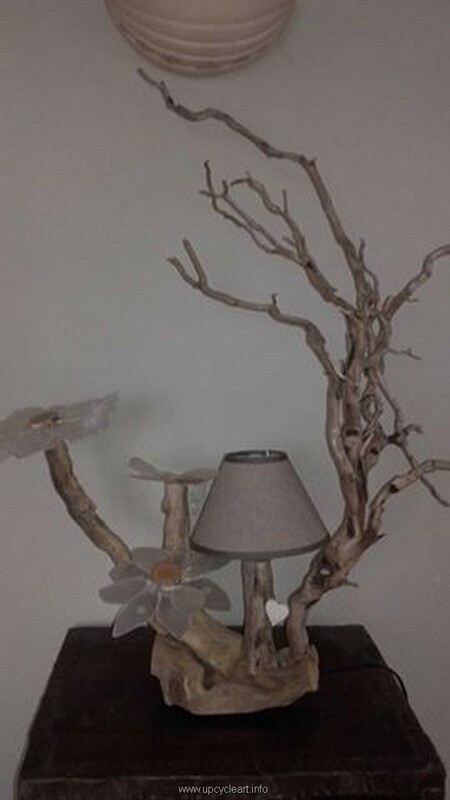 Like we have used a reclaimed lamp shade that was part of an old broken lamp and again for the embellishment we have used this artificial flower on each branch of the driftwood made tree. 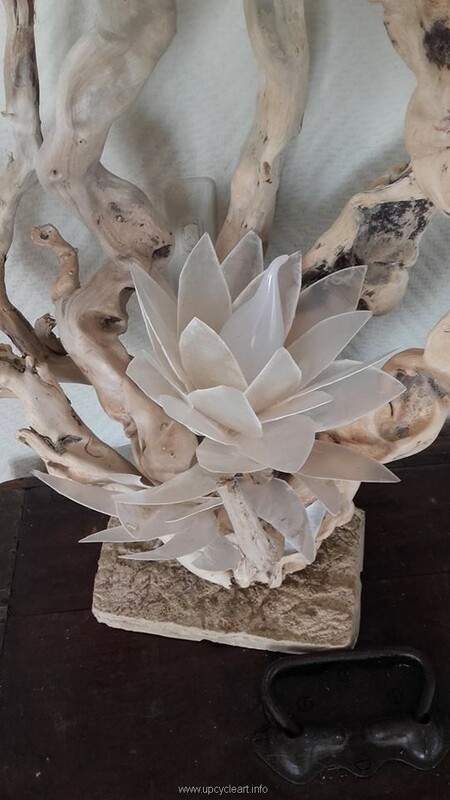 Depending on your ease and availability you can always resort to any materials that could possibly play some role in the embellishment or the decoration of the driftwood recycled project, this material could be random like anything that could be easily shaped and molded. You see this strange material that we are using throughout? 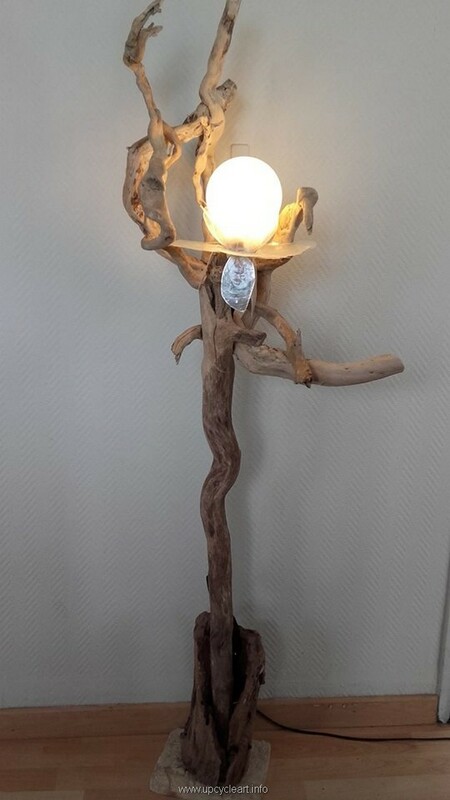 Well, as these driftwood lamps were meant to be completely decorated and totally presentable that’s why we have tried each and every compatible stuff here that could have been applied in this unique recycling plan. 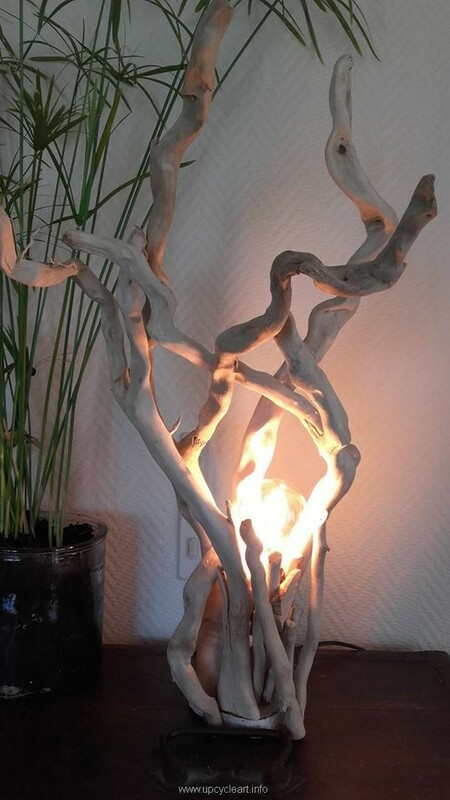 In this specific project we have merely resorted to some fresh and fine driftwood pieces. 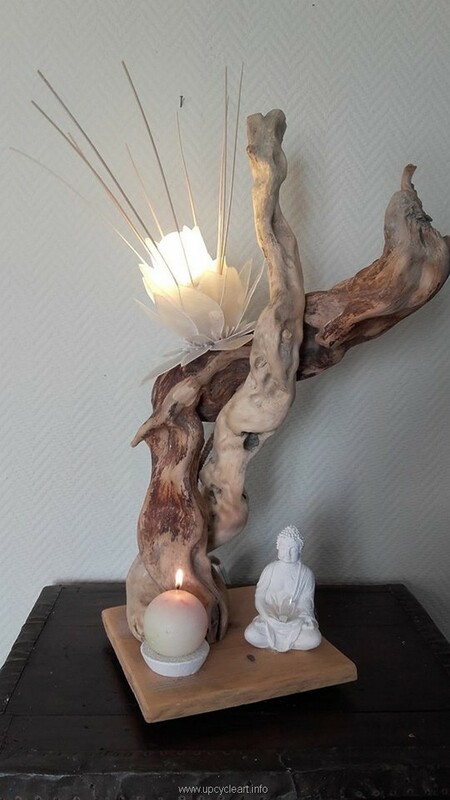 What we did here exactly, we have simply sorted out some similar driftwood pieces they are slightly alike in appearance, and right in the middle we have installed an Edison bulb like a blooming bud. 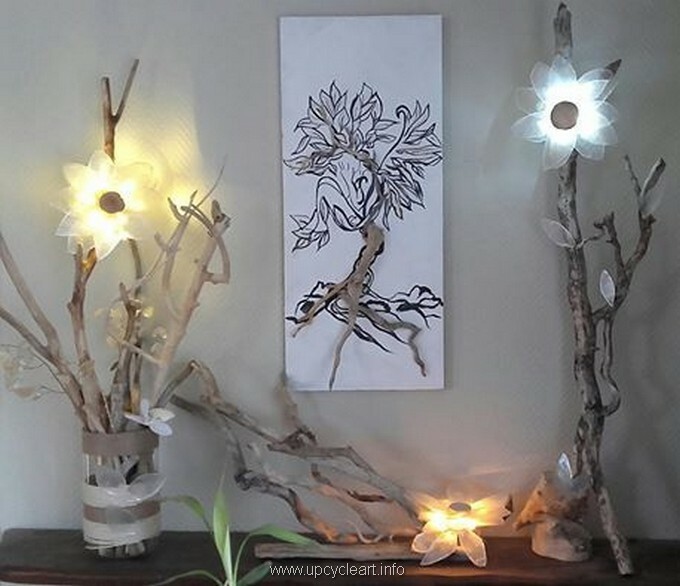 While making this crazy stuff you have to bear in mind that you have to arrange some material that is reclaimed from some old and broken lamps. 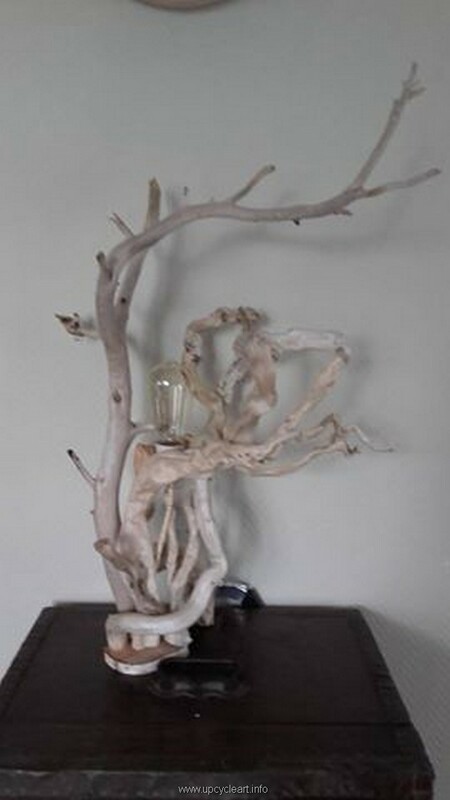 While making the selection of driftwood pieces make sure they are ultimately going to look good when they would be combined together in forming a lamp. 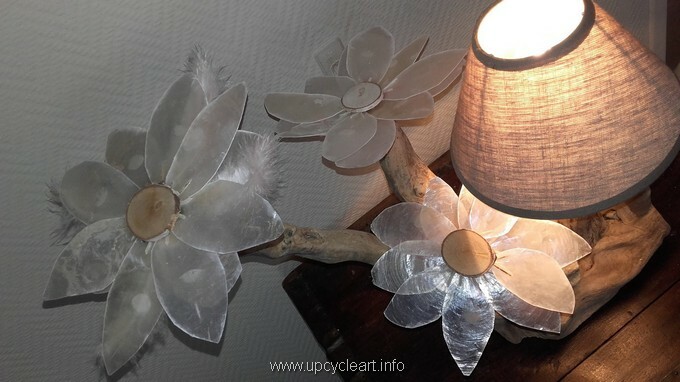 Here again we have used one simple embellishment right in the middle, and that is an artificial flower made using the cut pieces of a plastic bottle. 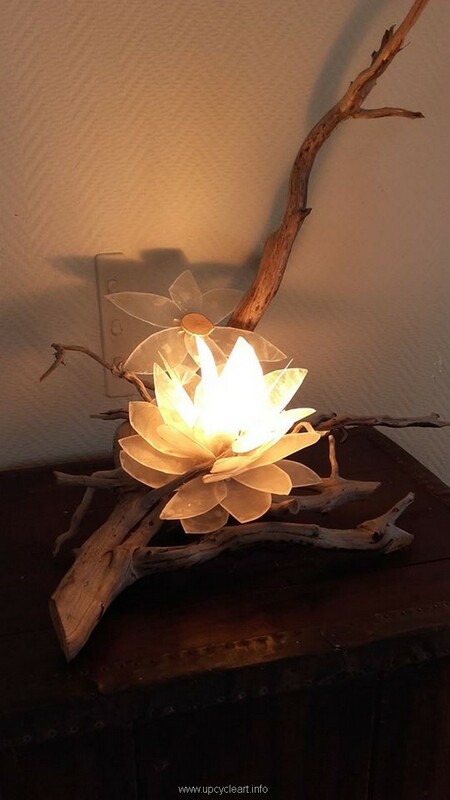 We basically have given it a shape of a bucket and on lighting up it seems like a blooming flower that is glowing with some spiritual light. 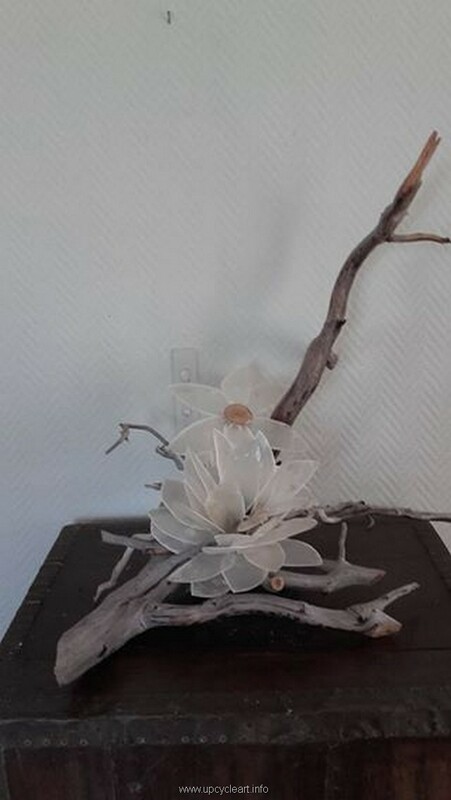 Look at the decently made artificial flower, you can use any material of your choice but we basically used here some raw plastic pieces that were obtained from the common plastic bottles that are easily available everywhere. 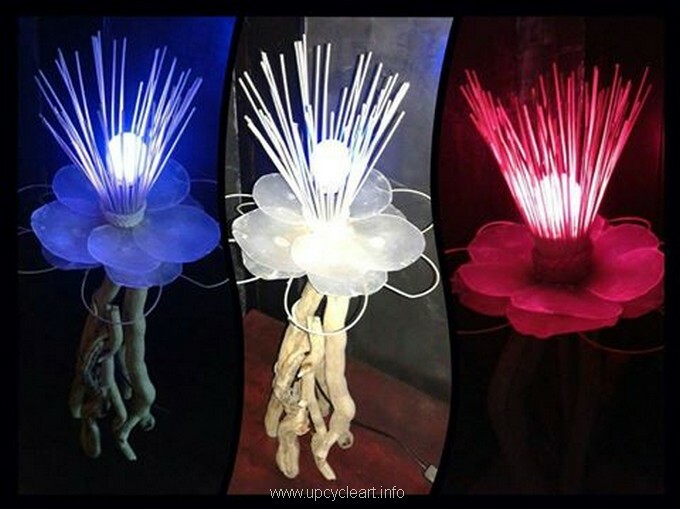 Their semi transparent surface would let a controlled amount of light out making it look more stylish. 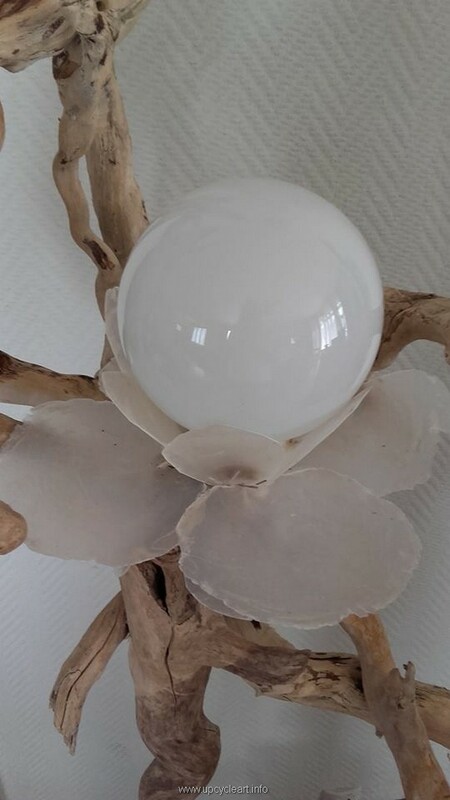 While here the main theme is again the same lighting globe that we usually see fixed in outdoors especially on the main entrances of the house. 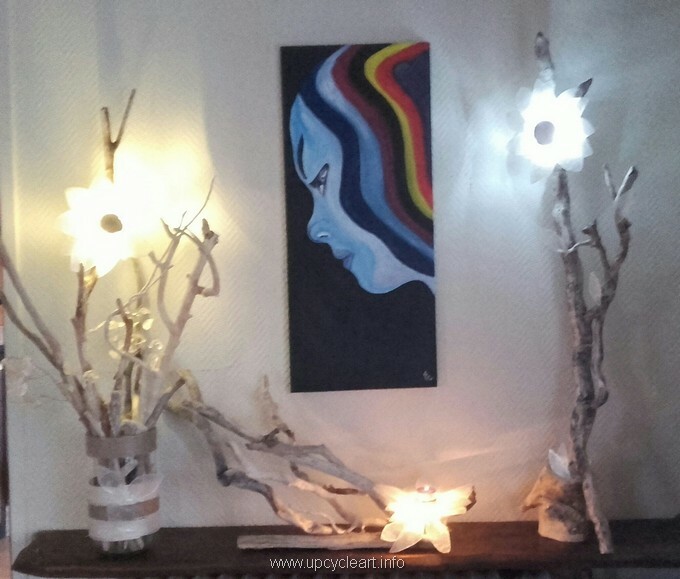 They can be bought from the market very easily and they play a vital role in recycling various lighting objects like this one here. 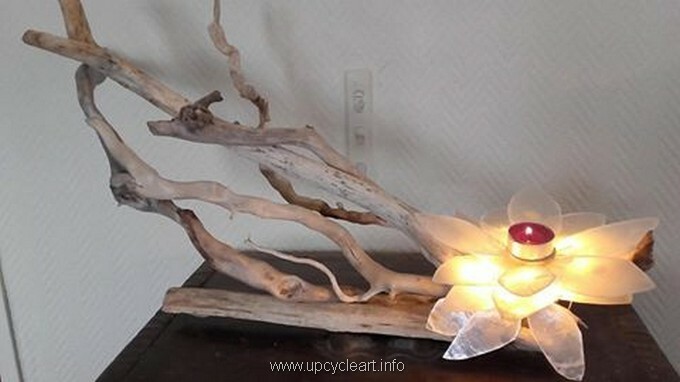 Even the driftwood pieces can also be obtained very easily like you just have to visit the nearest beach and from there you can collect a whole bunch of the driftwood pieces. The ultimate task is to sort out the similar looking ones together. 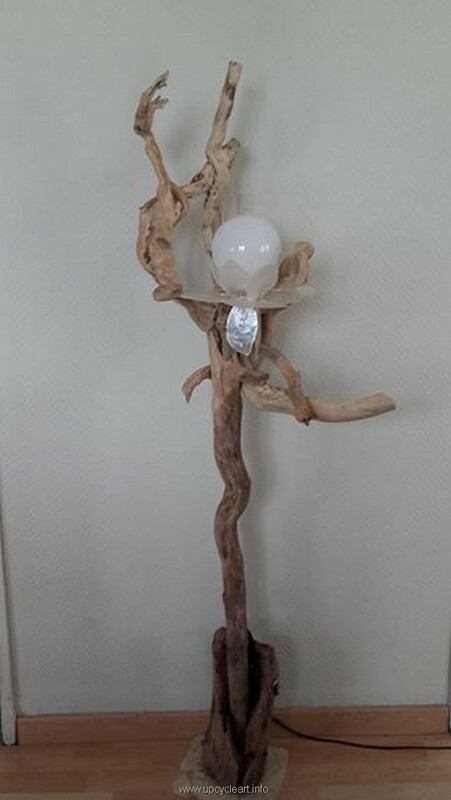 Once when you are done with the creation of the basic frame of the driftwood recycled lamp there are a various things that could be applied additionally on this frame and most of them could be reclaimed from same old broken lamps which are no more in use. 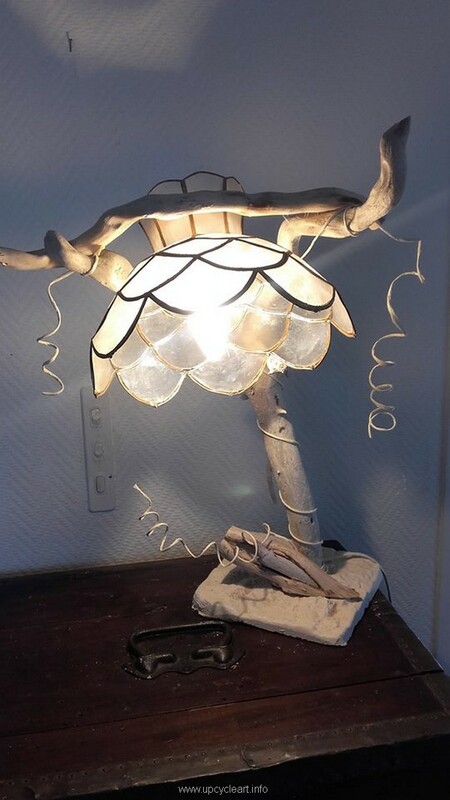 Here in this specific project the main theme or the essence of this project is the base or the bucket of the driftwood recycled lamp that is made with some waste material and scotch tape that are almost present in every house. 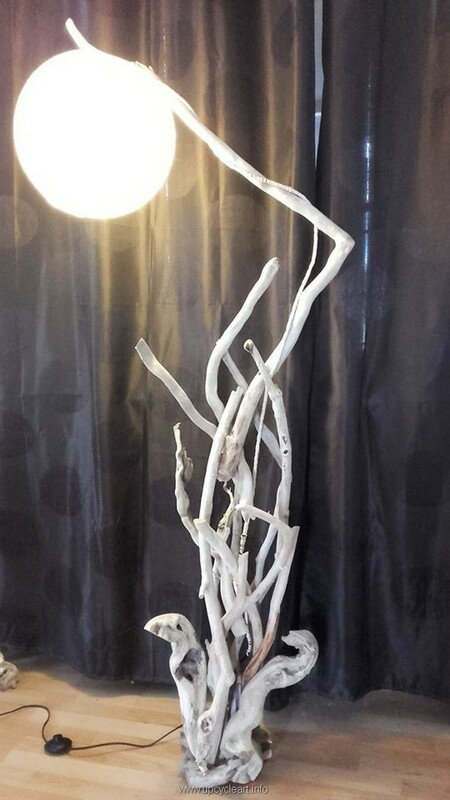 It gives an impact as if a plant is blooming out of a planter. 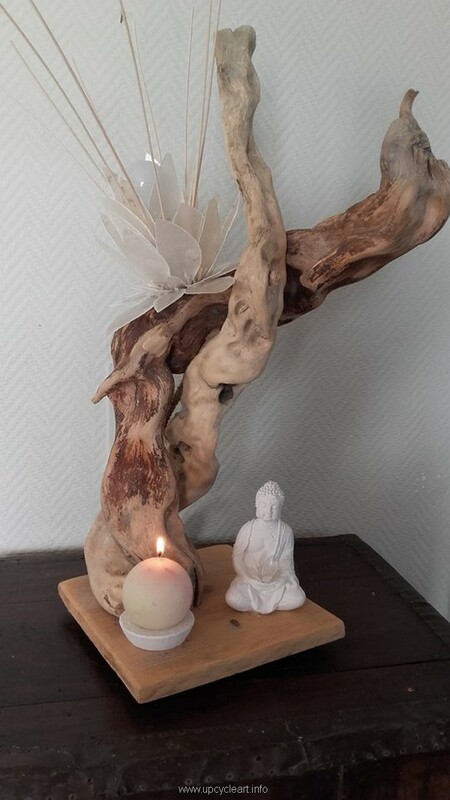 No matter how beautifully you have arranged the different driftwood pieces, this creation would stay looking dull unless you haven’t equipped it with some ultra stylish embellishment in order to turn it into something that can happily be placed in any part of the house. 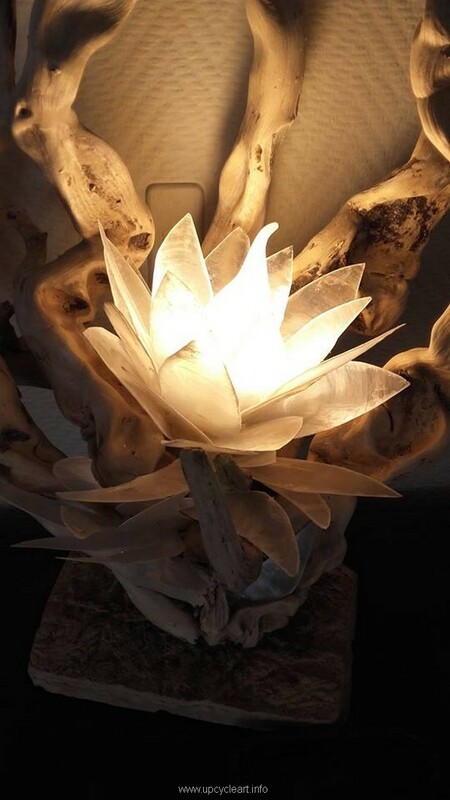 Same approach is applied here again like first we just focused on sorting out some mixed driftwood repurposed pieces which were slightly similar in shape, we combined them together and lastly for each separate project we used some differently shaped common Edison bulbs and that’s it. 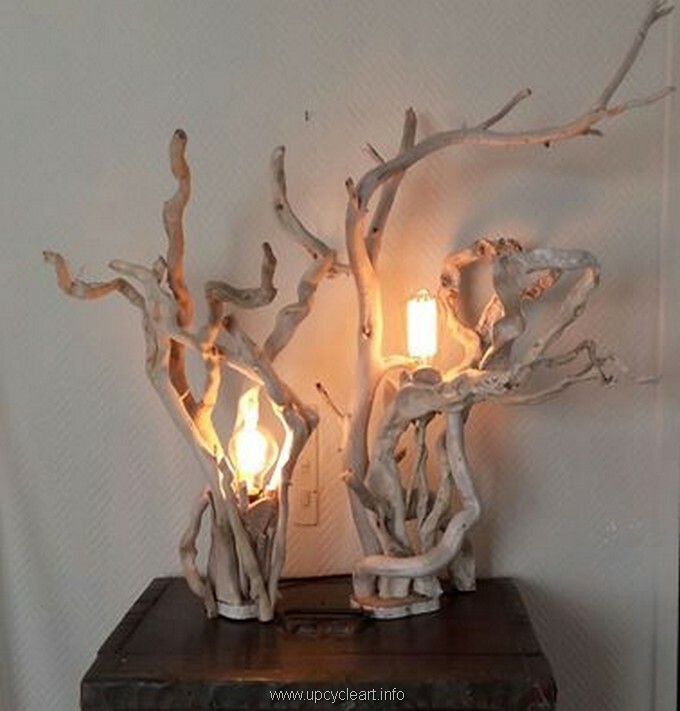 These artistic driftwood recycled lamps are meant to be made and designed for the ones who are deeply in love with such crazy and artistic creations. For some regular users this might not be something acceptable but for the last category they are simply a source of inspiration and satisfaction. 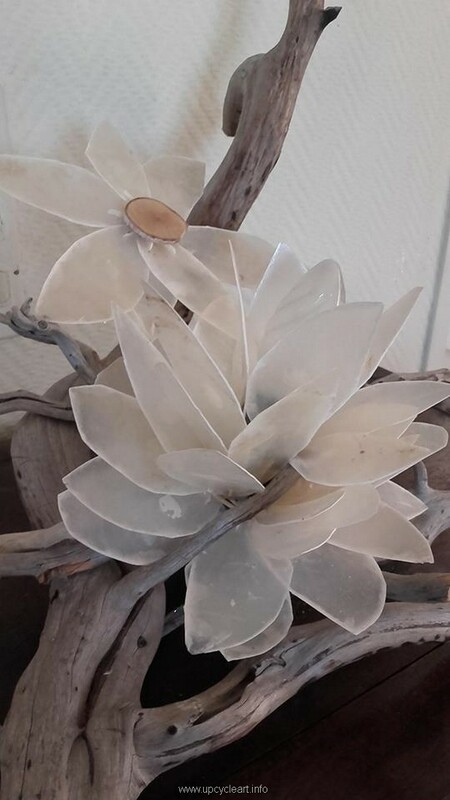 We are showing you an item that was made earlier, here we are looking it from close angle where we can also ponder upon the artificially made flowers that have given a new life to this dull looking creation. Use any available elastic material that could easily be cut shaped and molded. This takes any material that is available with you, and rest should be dealt with your smartness and making skill. 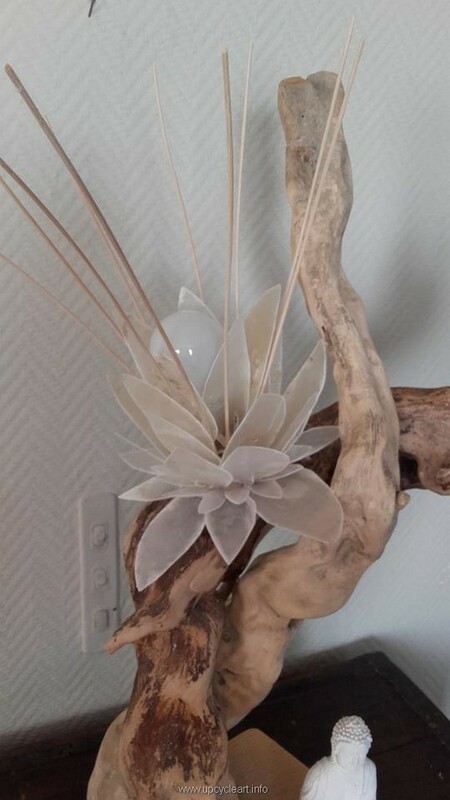 Like in this way you can turn some ordinary materials into some noticeable things as this flower is entirely made with totally raw material but in the end it is worth appreciation. 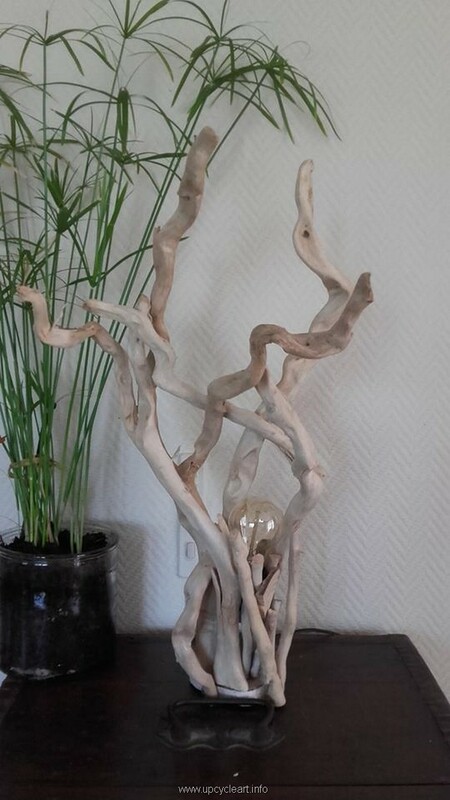 These driftwood pieces have got a certain shape from the top that this gives an illusion as if some sculptures are made out there manually, but actually this is simply an illusion. Yet the credit should be given because they are sorted out in such a smart manner. 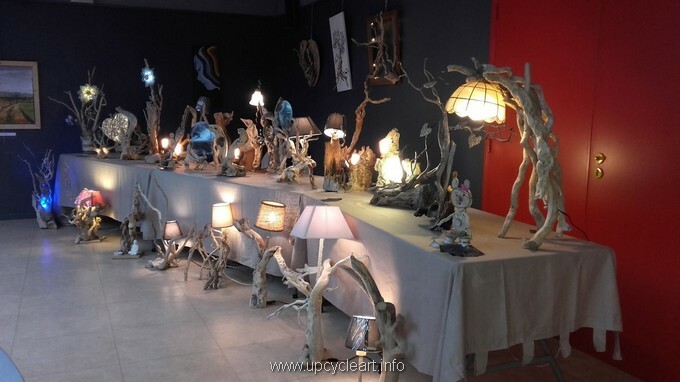 And here it feels like a whole exhibition is conducted displaying several driftwood recycled lamps that are decorated with some ordinary materials that are easily available to everyone and everywhere. 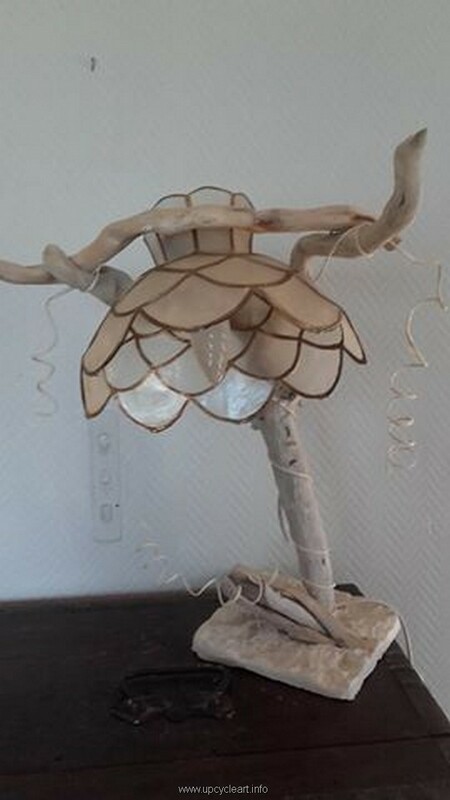 Lamp shades that were reclaimed are used here, metallic frames and various other supporting stuff is consumed in entire range. 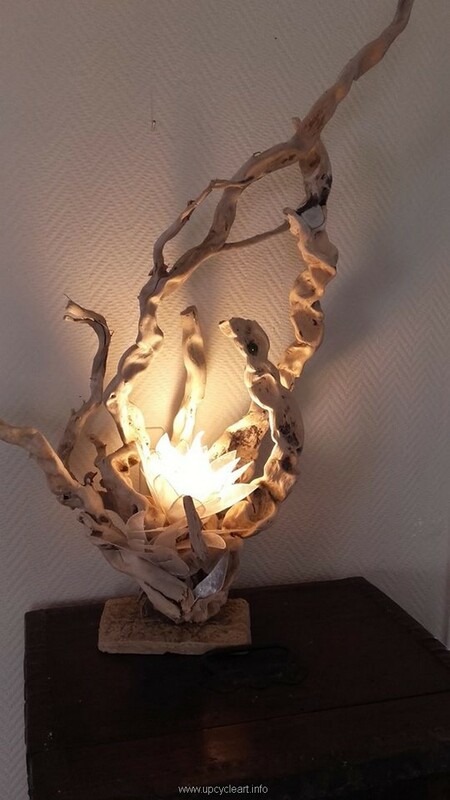 Again a very smart idea is displayed here, it feels like a pearl is coming out of the pearl seep. 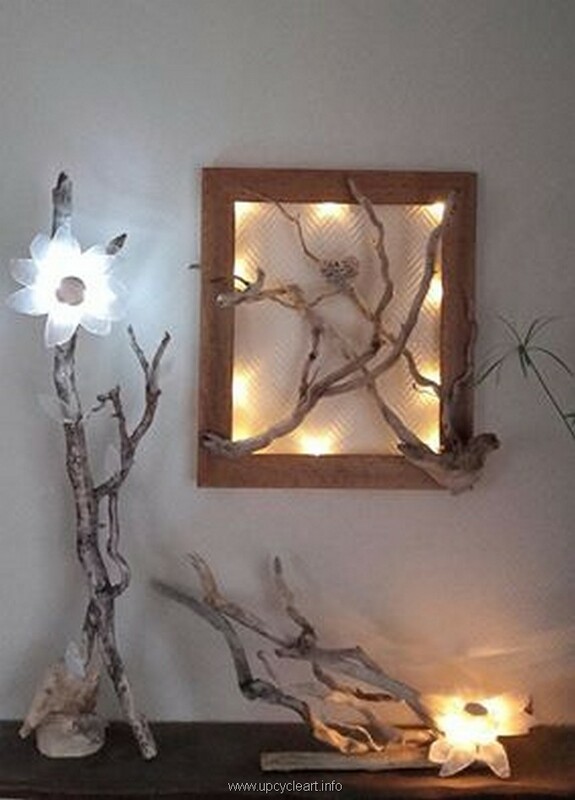 The driftwood pieces are fixed horizontally this time, this would offer a reasonable amount of light that would be sufficient in the night time. Atleast one out of this whole range must be given a try.